Windows Store apps provide new opportunities for enterprises to make line-of-business (LOB) apps that are complex yet user friendly, touch centric, fast, and fluid. 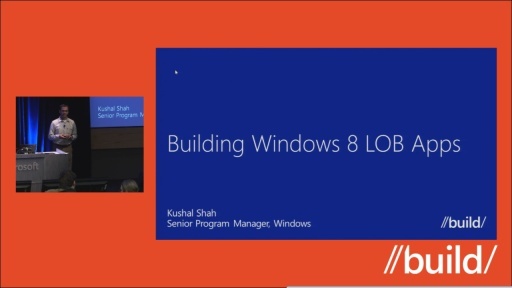 Learn about LOB scenarios that are a great fit for Windows Store apps. Also, learn about the management, design, and development platform capabilities for building these apps. Watching this was painful. There were no real LOB applications featured; just dashboards and remote desktops. At the start he suggests that 98% of apps could be moved to this new UI design and distribution model. I don't understand how 98% of LOB applications can be turned into what are essentially glorified widgets. It's so frustrating that Microsoft is pushing this type of interface so hard when its very evident that they couldn't get any of their business applications to work (i.e. : Office). Not every application should have an iPad equivalent. I feel like I'm taking crazy pills here!